Don't know what to write about in your new post? Are you unsure if your new topic will be found interesting? Do you want to know what people want to discover in your blog? 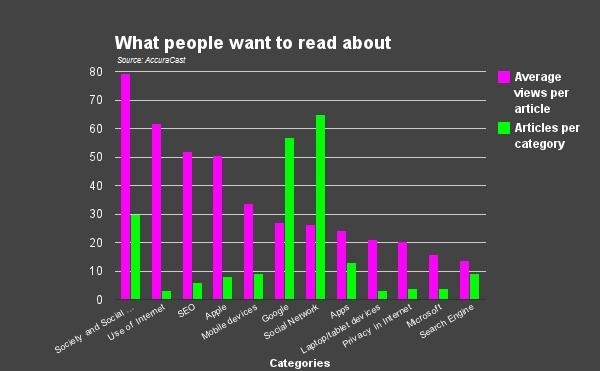 Well, the team at AccuraCast have undertaken a little research to find out which are the most read topics, within the world of online marketing and have used our own blog for the study. 218 articles from our blog, Searchdailynews, have been analysed and categorised into 12 relevant categories and following this, we calculated how many articles there are in every category. As some categories had more articles than others, to have objective results it had been necessary to calculate the average number of views per article. Moreover, to get even more objective results it had been necessary calculate the average of likes in Google Plus per category. This is because we thought that some articles or categories could have got more views because of more sharing in a Social Network, such as Google Plus. And finally we found out some interesting results! 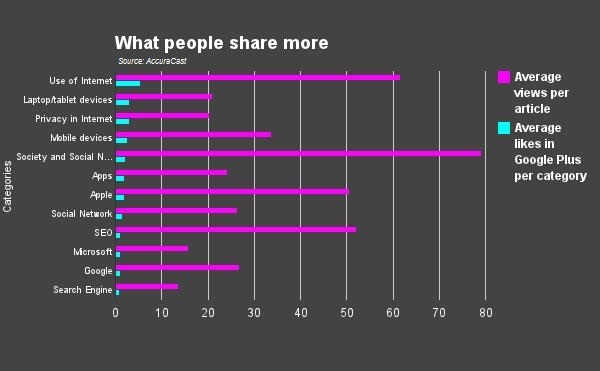 The three categories with the most articles are Social Networks (65), Google (57) and Society and Social Networks (30). Nevertheless, comparing the numbers of articles per category with the average number of views per category, we discovered that the categories with the most articles were not those with the most number of views. In fact the three categories that had got the most views were Society and Social Network (79.23), Use of Internet (61.67) and SEO (52). That means that even if you write less articles in a specific category, that doesn't mean that you will have less views. Moreover we can start affirming that people prefer to read and search more for articles speaking about these three topics: Society and Social Network, Use of Internet and SEO. At that point, a doubt can rise: are the views influenced by the sharing of the articles on Google Plus? Comparing the average views per category with the average likes in Google Plus per category it has resulted that the sharing on Google Plus didn't have to much effect. In fact the top three categories that got more likes were Use of Internet (5.33), Laptop/tablet devices (3) and Privacy in Internet (3) while the categories that got more views were, as we said, Society and Social Network, Use of Internet and SEO. So, what are you going to write in your next post?